I've prayed hard over this moment. Even before her passing. The day Jo asked me to give her eulogy, I asked God to start preparing me word for word what HE would have me share. Jo and I's friendship kinda took us both by surprise. What started off as a simple pay it forward act of kindness, turned into a beautiful friendship that only GOD'S amazing goodness could birth. I had no intentions the day Sara and Christy showed up at my doorstep other than doing the job that I love. She was graduating high school and we spent a couple of hours together like I do with every client. 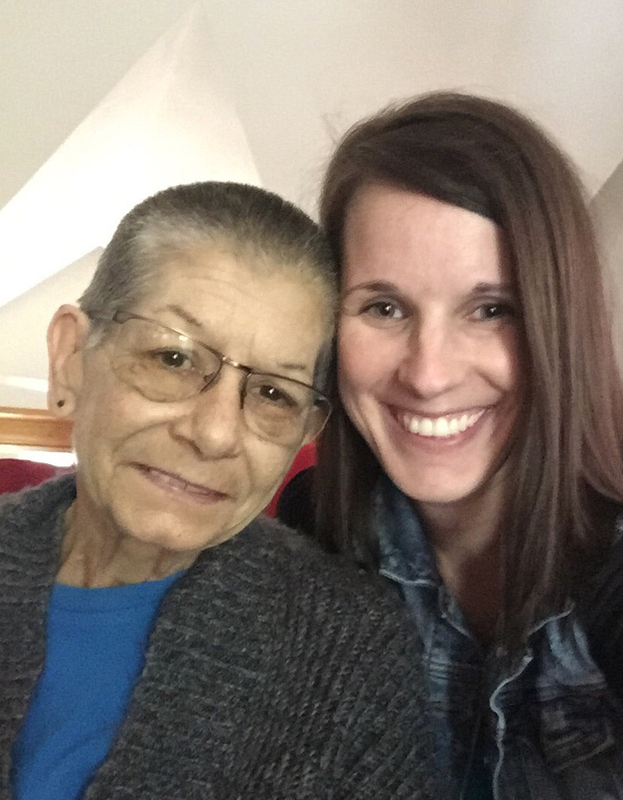 In that time Christy shared with me about her mother being diagnosed with terminal pancreatic cancer. Anyone's heart would break to hear of such terrible news. I offered to give them a family portrait session when the time got close, and all they would have to do was reach out to me. Late August that call came. And I met this beautiful woman. In the midst of this session, I was overwhelmed with wanting to know more about Jo. Christy shared with me a moment when Jo had prayed for God to heal her from cancer. She was convinced she would go to the doctor and it would be gone. Only to be disappointed that it was still killing her body. I was blown away by her amount of faith in God to boldy approach Him for this healing. But my heart broke thinking Jo was going to feel like God didn't love her enough to do so! By now my spirit was moving and God was stirring something up. It wasn't in an audible voice, but God was telling me to share my love for Jesus with her. Let me be honest, the Moses in me tried to find every reason why I was not qualified to share my faith with her. This was a little out of my element. I prefer my introverted life and living in my bubble. Not that I wanted to argue with God, but can't I just post an inspirational quote on FaceBook or something. Are you sure there isn't a more qualified person to pray with her? God are you sure? Am I usable? But when God says something you don't argue. You just move! I remember pulling over at quick trip to text Christy and set up a visit with Jo. Therefore we do not lose heart. Though we are outwardly wasting away, yet inwardly we are being renewed day by day. For our light and momentary troubles are achieving us an eternal glory that far outweighs them all. So we fix our eyes on not what is seen, but what is unseen. For what is seen is temporary and what is unseen is eternal. Jo shared with me a little bit of her past and how she accepted Jesus as her Savior along time ago. What JOY that brought to my heart! She was my sister in Christ. She knew she was a sinner and needed His grace and forgiveness. For weeks to come I came back to visit Jo. Each time praying and reading scripture together. This fall has been a terribly busy time for me with my business, but I would send daily video clips with scriptures and my thoughts about her. If I went one too many days with contacting her, she would message me saying she was praying for me and thinking of me. That alone should tell you the type of heart this woman had. Her body was growing weak, yet she was giving it no thought. She was praying for me. I still have every single video and text we exchanged. One amazing thing about knowing God and relying on Him for strength, is that He can make something so incredibly painful beautiful. Being with Jo during her final 24 hours here on Earth is something I will never take for granted. I cannot thank Ronnie enough for opening the door every visit and sharing his precious wife with me. Something so incredibly painful to watch, I am still able to thank God for giving me these last few moments. Jo and I didn't speak much. I won't lie. I found myself speechless at moments. Lying next to her while she slept I plead with God to give me the right words to speak in her final moments. "God how can I love someone so much that I hardly know? What do you want me to say to her? What can I do to help her" His response... JUST LOVE HER through it He said. No words.... JUST LOVE. I do not expect too many people to understand Jo and I's connection. It was strong. And it was deep. I mean, how do you grow to love a complete stranger that you have only known for 8 weeks. I stand in the midst of this woman's closest friends and family. People who have known her their whole lives and had the honor of loving her a lot longer than I! I never got to know Jo's favorite color, or her favorite movie. I never got to know what her favorite food was or what her hobbies were. There is so much I will never know or have the chance to ask her. However, I can tell you her favorite animal is that ridiculously hyper dog scooter! These past two weeks have been a whirlwind of emotions and tremendous spiritual growth for me. I still am in awe over how Jo pulled me in as one of her own at such a personal, private, and sensitive time in her life, and the life of her family. So you see, it started out as just a part of my job as a photographer. And it ended as something much more. I don't know how to explain it other than being a complete God thing. I think back now, and wonder what I would have missed had I caved into the fear of not being good enough to go back and pray with Jo. Thank you Lord for choosing me! I owe it to Jo to share this with people. With strangers I might add. Why? Because there are more Jo's out there. And we pass by them everyday! Someone does not have to have cancer for you to stop and love them. Yes, love a stranger. Can you imagine what our world would be like if we allowed God to bring a "JoAnn" into our life. Don't be afraid to love a stranger. You might just walk away with a friendship that will forever surpass all time. I will end with this. Jo fought hard. Not only physically. But spiritually. And she did not fight alone. Her victory came and Jesus brought her to her destiny. The same destiny we were all created for. Through the blood of Jesus we are all given that chance at eternal paradise where sin and sickness no longer reign. A place where sin and cancer are not allowed and bow at His very name. A place where tears and grief do not exist. I know if Jo could talk to us now, she would tell you Jesus is everything He says He is. We all have a purpose and a mission to share His love with all. I will miss her so much. However I have peace in knowing that by His stripes she received her healing and is living out her eternal life, cancer free. Cancer did not win~ Love did on the cross over 2,000 years ago.